Cardigan only, any not included. 1 x Cardigan. Material: Knitting wool. It looks cool and fashionable, warm and comfy. Size: One size (Chest circumference: within 120cm | Length: 87cm | Sleeve: 57cm). Semi-sheer burnout pink with pink & white striped contrast panels at hemline and sleeve trims. - Lightweight knit. Long-sleeved pullover sweater. - High low cut. A NEW SILKY CLASSY LONG TUNIC SWEATER FROM WONDERFUL VINCE. A DEEP V NECK SO YOU CAN WEAR A LITTLE SILK CAMI INSIDE IF YOU CHOOSE TO. WEAR IT OVER A LOOSE SILKY SHIRT TO COMPLETE AN ENSEMBLE WITH A PAIR OF NICE SLACKS. High quality and genuine coins. Sweaters are a wardrobe staple. They can be layered or worn on their own. There are sweaters for all seasons. What are some common styles? Pullovers: This is a standard design. There are many neck and sleeve variations. Some are fitted while others have a loose tunic cut. Cardigans: Cardigans are open-front garments. Cardigans are used by women who like to dress in layers. Poncho: - These knits resemble the traditional poncho. Sweater vests: These look like sleeveless sweaters and are meant to be layered over other types of clothing. They often have a v-neck. Both cardigans and pullovers come in a variety of sleeve lengths. What are some necklines for pullovers? What are some common sleeve shapes? Raglan: This is the most common type. Dolman sleeves: The Dolman tapers from the elbow to the wrist. A variant is the batwing, which doesn't taper until just before the wrist. Bell sleeves: This design billows toward the wrist in a bell shape. All these shapes may include details like ruffles. What are some cardigan sweater types? Waist-length: These cardigans tend to be more fitted than some other styles. 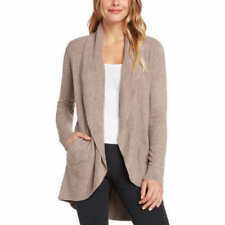 Professional women generally wear this type of cardigan at work. Oversized or slouchy: These cardigans are for women who prioritize comfort. They often have long sleeves and have shawl collars. Boyfriend: These cardigans are often also oversize or slouchy. However, they are specifically styled to mimic men's cardigans. Wrap: This is a generously sized cardigan that you close by wrapping around your body. Many women use this style for lounging or casual environments. What fabrics are used to make sweaters? Many sweaters are made of fabric blends. Be sure to check the label. Wool: This is one of the most typical materials. Cashmere: Cashmere is a special type of wool. It is prized for its softness. Silk: Many lightweight sweaters contain silk. Cotton: This versatile fabric is found in both heavy and light sweaters. Acrylic and polyester synthetics: These fabrics add bulk to winter clothing. Sweaters can be knitted to be heavy or lightweight. They can also be loose-knit or tight-knit. Women who like layering may prefer loose-knit knitwear. Most sweaters are available in women's sizes from petite to plus.